Here's how to edit your audio using Omny Studio's inline editor. The cut editor is a simple audio editing tool to join, split, trim-in and trim-out recordings and clips segments to produce new clips. To edit the a clip, just click on "Edit Audio" in the top right-hand corner. Note: Clicking "Edit Audio" will edit the current clip file. To edit a copy of the clip and keep the original unchanged, click the drop-down menu next to "Edit Audio" and select "Clone as new clip". 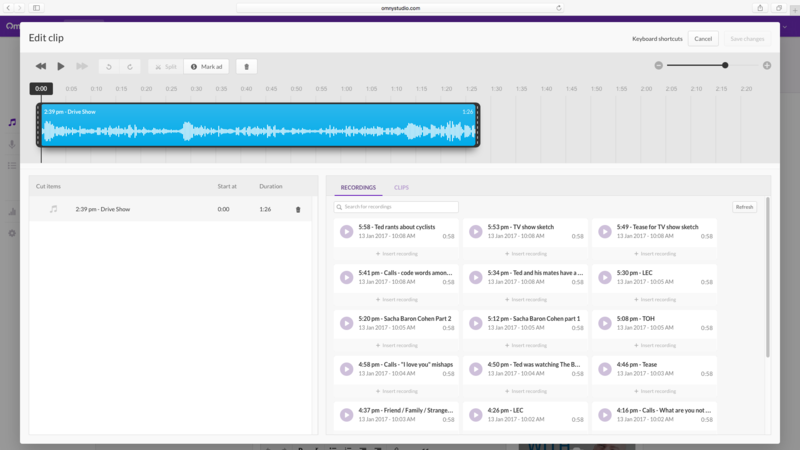 The editor allows multiple recording and clip segments to be joined together in the order they are presented on the timeline. 3. Click the add button on each segment or drag and drop the segment onto the timeline. You can trim the start or end of any segment. If the handle does not move, you may be at the start or end of the segment and the audio cannot be extended any further. You can split a segment into separate parts at any position. This makes it possible to delete unwanted segments of audio. 2. Click the the scissors icon on the playhead or the “Split” button in the toolbar. If the “Split” button is disabled, a split is not possible at the desired time. You can move segments around on the timeline to change the order. 2. Click and drag the segment in the timeline and move it to the new desired position. The new position will be indicated by an orange marker on the timeline.